Although this year's Tomb Raider reboot made our latest list of most anticipated PC games, I must admit that it was one of the games I was least looking forward to from a performance perspective. Previous titles in the franchise have received mixed to positive reviews, but gameplay aside, their visuals weren't exactly mind-blowing so we've never bothered doing a performance review on one — until now, anyway. 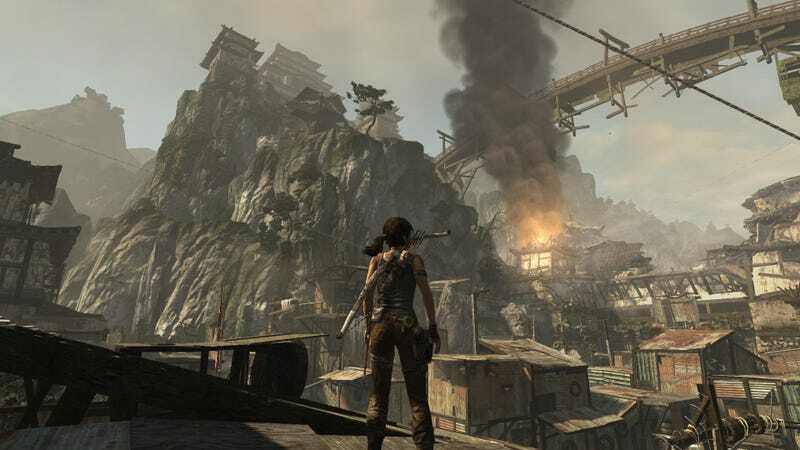 As with the last few entries, Crystal Dynamics developed the new Tomb Raider using the Crystal Engine — albeit a heavily modified version. Being a multiplatform release, we were naturally worried about the game being geared toward consoles with PC being an afterthought, which has become increasingly common (Dead Space 3 comes to mind as a recent example) and generally results in lackluster graphics. Those concerns were at least partially alleviated when we learned that the PC port was being worked on by Nixxes Software BV, the same folks who handled the PC versions of Hitman: Absolution and Deus Ex: Human Revolution, both of which were great examples of what we expect from decent ports in terms of graphical quality and customization. Hitman in particular really stressed our higher-end hardware. We were also relieved to learn that Tomb Raider supports DirectX 11, which brings access to rendering technologies such as depth of field, high definition ambient occlusion, hardware tessellation, super-sample anti-aliasing and contact-hardening shadows. Additionally, compared to the diluted console versions, the PC build offers better textures as well as AMD's TressFX real-time hair physics system. The result should be a spectacular looking game that pushes the limits of today's enthusiast hardware — key word being "should," of course — so let's move on and see what the Tomb Raider reboot is made of. We'll be testing 27 DirectX 11 graphics card configurations from AMD and Nvidia covering a wide range of prices from the affordable to the ultra-expensive. The latest drivers will be used, and every card will be paired with an Intel Core i7-3960X to remove CPU bottlenecks that could influence high-end GPU scores. We're using Fraps to measure frame rates during 90 seconds of gameplay footage from Tomb Raider's first level, the checkpoint is called "Stun." The test begins with Lara running to escape from a cave system. Our Fraps test ends just before Lara exits the cave, which is ironically where the built-in benchmark begins. We decided to test a custom section of the game rather than the stock benchmark because this is how we will test Tomb Raider in the future when reviewing new graphics cards. Using Fraps also allows us to record frame latency performance, though for this particular article we didn't include those. Frame timings weren't included for two reasons: it's not easy to display all that data when testing 27 different GPUs, and we feel Nvidia needs more time to improve their drivers. We'll include frame time performance for Tomb Raider in our next GPU review. We'll test Tomb Raider at three common desktop display resolutions: 1680x1050, 1920x1200 and 2560x1600 using DX11. We are also testing using the three top quality presets that includes Ultimate, Ultra and High. No changes will be made to the presets. Ultimate quality unsurprisingly calls for an ultimate GPU — probably more than one. Even at 1680x1050, it took an HD 7970 or GTX Titan to render an average of more than 60fps, while the minimum frame rate of the 7970 was around 30fps. Nvidia's cards continue to struggle and the minimum frame rates are far too low as the GTX Titan dropped to just 19fps in spots. For now, those wanting to play Tomb Raider are far better off with an AMD solution as the HD 7970 GHz Edition was able to deliver more consistent performance than the GTX Titan and it offered substantially better results than the GTX 680, which ranked lower than the HD 7870. Playing at extreme resolutions such as 2560x1600 or beyond will likely require more than one GPU with the fastest GPU tested (the HD 7970 GHz Edition) averaging only 34fps with a minimum frame rate of 21fps.